Today place into the dish a lot of Italian tradition seasoned with a delicious red wine sauce! The bucatini pasta is a traditional kind of spaghetti thicker than normal with a small hole into the center. A classic recipe with bucatini is Amatriciana: tomato sauce and guanciale. Do you know what the guanciale is? It is a cured meat very famous in Italy but still little known and exported abroad, but recently it’s starting to appear on the delicatessen counters worldwide. 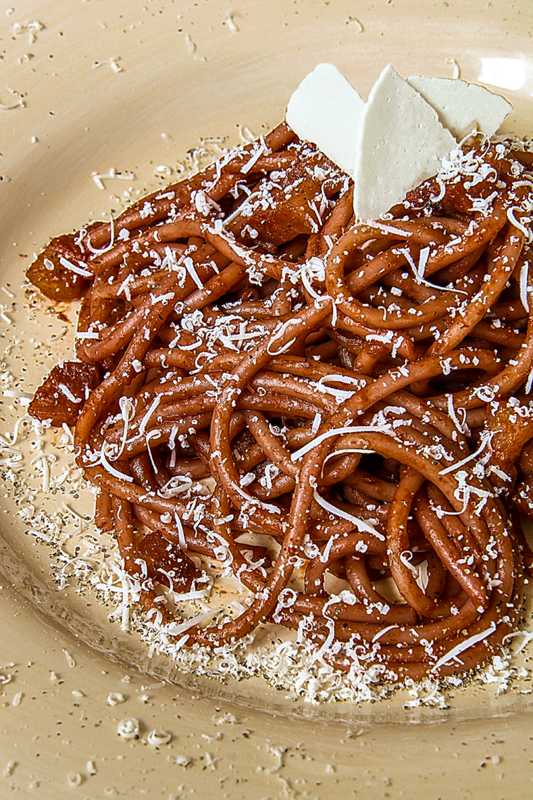 Today I suggest you a classic of Italian tradition: the “bucatini ubriachi” (drunken spaghetti). In this recipe, the wine will be poured almost all into the pan, so the quality of the wine must be very high! To finish the sauce, flavor it with diced guanciale (or pancetta if guanciale is not avaiable) and a generous sprinkling of ricotta salata and black pepper.